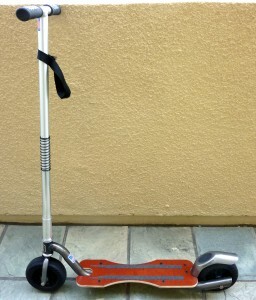 The most popular scooters in the United States are the small folding kind. The fact that they can fold up and be carried makes them so much more versatile than the scooter that remains it’s full deployed size and is basically a bicycle without the seat or the drivetrain. While you may own one of today’s excellent push scooters such as the amazing KickPed, or perhaps a Xootr Mg or a Xootr CityKicker, or a Micro Black or a Razor A5, you can still use the same technique as the European athletes who race their larger Footbikes. Usually, when I am scooting around, I never see another person on a scooter, but on the rare occasions that I do, I see them wasting energy, robbing themselves of forward speed. No wonder so many people sacrifice the convenience of a scooter for the efficiency of a bicycle. Now I will not argue that a scooter can match bicycle efficiency because it is not a machine. A bicycle is a machine that has gears and pedals, so whether it has only one gear or ten, it converts pedal motion into more forward motion per caloric input than any scooter can. But not everyone can be comfortable sitting on a hard saddle and moving their feet in circles all afternoon. I for one, prefer to stand, even if it compromises how fast and how far I can go. And so I am a kick scooter enthusiast. 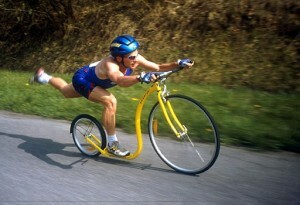 If your goal is to be as fast as possible then perhaps you should be on a KickBike or Footbike, because they will take you along faster than a smaller wheeled folding scooter, but the dynamics used by the racers can also save us energy during our casual rides on our more convenient folding scooters. The first thing to pay attention to is unintentional braking. I see it all the time. A rider will provide forward motion with a kick or push and then immediately cancel out some of that energy by dragging a shoe on the road or by inadvertently applying the rear spoon brake. Another way the casual scooter rider will rob themselves of efficiency is with the handlebars. By unintentionally turning the bars they lose energy as the front wheel acts like a skier swerving or ploughing to control downhill speed. Keeping as straight a course as possible will reduce how much forward inertia is converted to friction and heat by the front tire. On scooters with wider platforms, such as the KnowPed and Xooter MG, efficiency comes from balance. The standing foot needs to be close to the centerline of the deck. If you stand on one side, then you will be compensating by leaning and steering, which are effectively braking techniques which rob energy from your forward motion. But the key to getting more efficient forward motion from the same set of muscles is to use gravity as your assistant. We convert falling into going. The ideal power stroke involves swinging the kicking leg forward and then flexing the supporting leg as the kicking leg comes down to allow your foot to meet the pavement slightly ahead of your center (but flat, not on the heel), and then you dip your body straight down by bending the standing leg. The propelling foot on the ground then has to roll back onto the ball of the foot and the toes, at the back of the stroke. That final slight pointing of the foot provides the final flicking thrust of the stroke. And then that same leg swings forward again as you rise back up, providing another seemingly magical forward thrust without any ground contact at all. Using gravity may sound like a complicated athletic feat, but it uses no more energy than a normal kick, and it takes you more than twice as far. Having a bendable flexible shoe also increases how much thrust you get out of one identical kick. A rigid skateboarder’s sneaker will waste energy. A bendable running shoe that allows you to articulate your toes will give you an extra free push on every stroke. In fact good bendy running shoes, as opposed to skateboard shoes or cross trainers etc., are like high octane fuel for your kick scooter, but do not rely on that cushiony heel to to jam your heels into the road, or you will get a heck of a pain in the Achilles tendon. Your foot should hit the road gently and the whole foot should be planting down slightly forward of your center, or right beneath you, but not too far ahead of you. Eventually you will want to switch feet, because your standing supporting leg, the one flexing up and down on the footboard, will get tired if you do not. The most efficient way is to use the scooter racer’s hop switch technique. As the kicking leg comes forward again from the back of it’s stroke, it neatly lands upon the footboard as the other foot smoothly jumps off to continue the forward swing that the first foot started. This takes a lot of practice, but since you will be going for many rides on your scooter, you can practice a little on every ride. Eventually your switching of the foot will be hard for any observer to see. Your hands and arms also come into play. If you are too tall for your scooter, or if your handlebars are too low, you may find yourself bending over and supporting your weight on the handlebars. This will transfer the vibration from the road through your arms and shoulders, which is tiring, but it also robs you of forward speed. Similarly, a handlebar that is too high may cause you to do inefficient wheelies. Ideally, the hands should be slightly below your elbows when you are standing on the deck of the scooter. And ideally you should keep both hands on the grips and be aware of the forces so that you neither push down nor pull back. Aim for neutral force on the grips. The exception is when you approach a pavement crack. 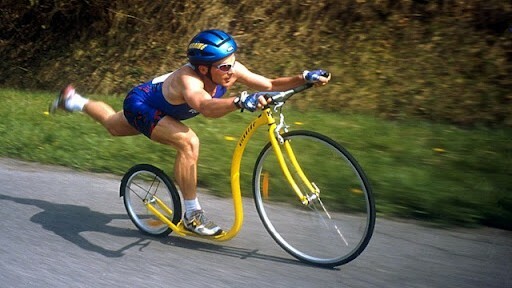 A little pull back and up will help the front wheel over that speed-robbing obstacle. I learned these techniques slowly over more than three decades of scooting, but I mastered them when I had a KickBike. However, now that I ride my KickPed, all the same rules apply. This is not to say I ride fast everywhere, I do not. like to stand upright and look around and take my time. But when I want to, I can really make my little KickPed fly. So, even if you have not yet saved up to buy a KickPed or a Xootr and you are still borrowing your kid brother’s beat up old Razor with the worn down wheels to go riding, you can start to think about these techniques for speed and endurance, and start to practice them for when you have that shiny new ride. Believe me, you will soon find yourself calmly speaking to that out of breath cyclist who is going the same speed as you! I use a kickbike and have found that the best shoes of all for kick are boat shoes. You can get them with laces, not just the slip on moccasin. The soles are almost flat, very flexible and, as a plus, are non-slip. I used to scoot wearing boat shoes. While I agree with the advantages, I find that much more impact protection and cushioning is needed, and that a running shoe provides these qualities. It was my KickBike period that led me to this conclusion. Me too. I used to wear Sperrys, no socks, and scoot and scoot all summer, but light running shoes with running socks inside are definitely a better idea. And the worst thing to do is wear sandals or flipflops. You can cut your exposed toe badly on the road. Great tips. You have helped me ride more efficiently. I am amazed how far and how fast I can ride using the hop-switch. It feels like someone has their hands on my back pushing me along. Exceptional article about scooting, rarity.